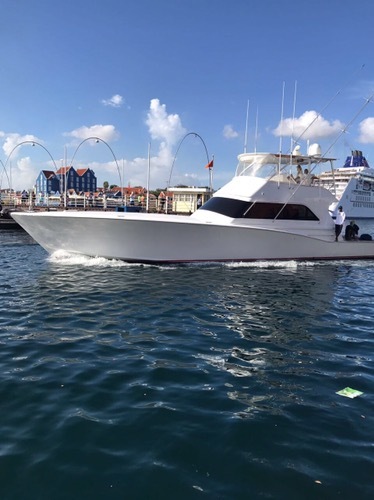 The past week I have been running the Picante which is a 60′ custom Sportfishing boat based out of the Southern Caribbean island of Curacao. I arrived on Tuesday and we left that night to go out jogging for blackfin tuna under the many tankers drifting just offshore. We had a severe lightning storm hold us up, but we did slip out and we whacked 18 blackfins in an hour on jigs. We had a blast! What an awesome and co sister fishery they have there. After that we made our way to Aruba for the Presidential Challenge billfish tournament. We fished half a day to the South and West of Aruba with just a couple mahi and a Sailfish bite to show for it. We got in a half day of practice and fished to the North of the island of Aruba on Thursday. We fished the edge in 600-1000 feet in 83.5 degree blue water, and picked at mahi and released a Blue Marlin. Small confidence booster, but kind of ended up being a curse. Day 1 of the tournament, Friday, we started off in the same area and this ended up being a mistake. The bite ended up being offshore and by the time I got out there it was too late. We didn’t get a bite all day other then from a couple mahi. I certainly was very disappointed and knew I had to learn where to be fast here. Day 2 we ran offshore and got a White Marlin early in 500 fathoms off the right flat black Party Hat. We worked the area for a while but no more bites. We spent hours trolling around seeing no life other then whales, dolphins, and flying fish. Finally at 2:00 we had a double header of white Marlin come up on thenlong riggers and we missed em both. Ouch. I started working the area and marked two nice bait. All down at 110-130 feet. We raised a triple of Sailfish but we’re only able to get 1 to eat and released that one at 2:27. 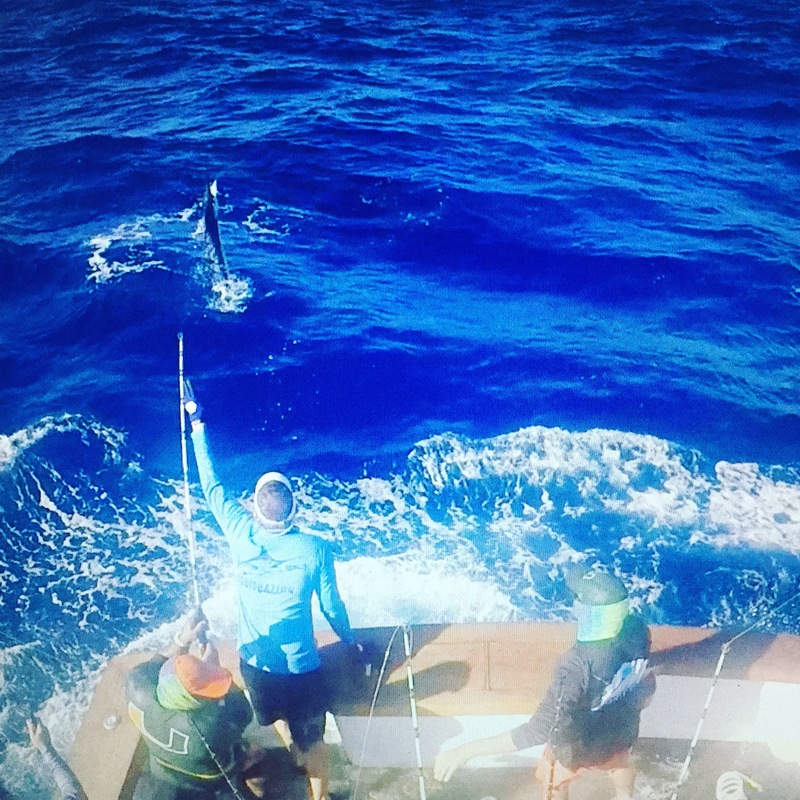 Then up on the left teaser was the perfect little 80# blue Marlin that switched nicely to the flat and we released that one at 3:19. 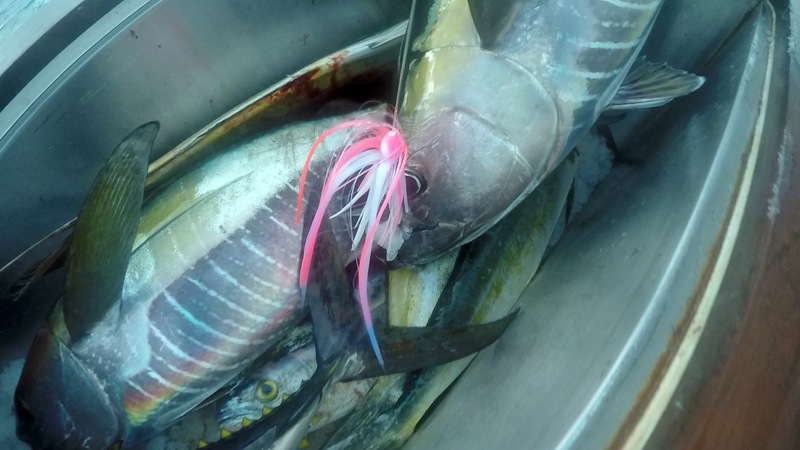 Shortly after that we got another left teaser bite (fish were all about the Squidnation pink squid chain with a blue and white Ilander Express chaser) and we release that white at 3:57. Then with a minute to go we raised another white on the left teaser but we could not hear the call on the radio for lines up. We hooked the white but seconds too late. We did go on to release the white Marlin but we were just a bit too late. Day 3 we went right back out to the same area. Sitting in third we were in the hunt, but we needed a good day. The morning was very very slow for us. Around 1 we hooked into a 50# wahoo and lucked out on the circle hook. We landed the hoo luckily, but that wasn’t a fish we needed… finally we raised a Sailfish on the left long that never ate. We marked bait at 80-120 feet and worked it hard and the fish were there. We went on to miss a Sailfish, a White Marlin, and a Blue Marlin in about 5 minutes. Pretty amazing but huge bummer we couldn’t get hooks into any. Finally we got a White Marlin on the switch from the left teaser and released that one at 2:51. Then with 3 minutes to go we had a Sailfish come up on the right teaser and we got it on the switch to the right flat. We ended our tournament with a Sailfish release that put us in a tie for third but unfortunately the other boat had their fish first so they took third place on time. We had a great time and had our fair share of excitement. 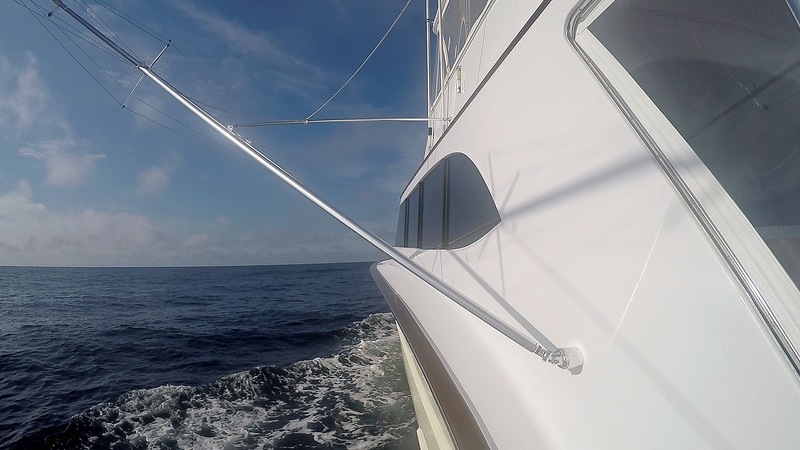 The white Marlin bites were aggressive with a lot of flat line and teaser bites making it so much fun. We made our way back to Curacao on Monday and called it a fun trip. I had a blast! Big thanks to the crew of the Picante for having me be their Captain for the week. 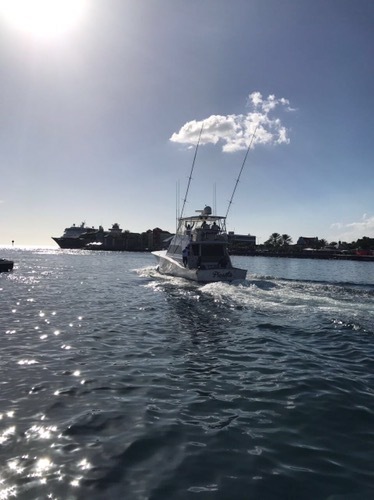 In case you didn’t already know, I am now running a 65′ Paul Mann Sportfishing Boat for Charters in various locations such as New Jersey, Isla Mujeres Mexico, and Cat Island Bahamas. You can see plenty of information here on my site in the CHARTER section. We have been able to get in a few trips here during the tail end of the offshore season and here is some action from them. Finally with a small weather window we slipped out on Trade In searching for a line class record Mako. Fall shark fishingnis always a crap shoot but it does pay off at times. We started up around the Cayru Wreck on the 20 line and had plenty of bait in green 66 degree water, but no bites. We did two more drifts working down the 20 fathom line and ended at the 28 mile wreck. No love from the fish today. Imaged for Captain Joe Trainor on an overnighter searching for whatever wanted to bend the rod. The seas were 3-7 feet throughout the duration of the trip with wind in 15-25 knot range out of the NE. We have had sustained NE winds for about a month now so it has been tough to get trips in, and with what seems like never ending cloudy and mixed cloudy days, getting positive satellite images has proven difficult. Regardless, we had a small “window” here to get this trip in and went for it. We started in the Wilmington just outside the natural 100 fathom line and found the 72-75.5 degree temperature break. We got a few bites right away and connected on one nice yellowfin that went 75 pounds on the scale. We hooked into a nice wahoo that skied out on the short rigger on the bite which was awesome to see. 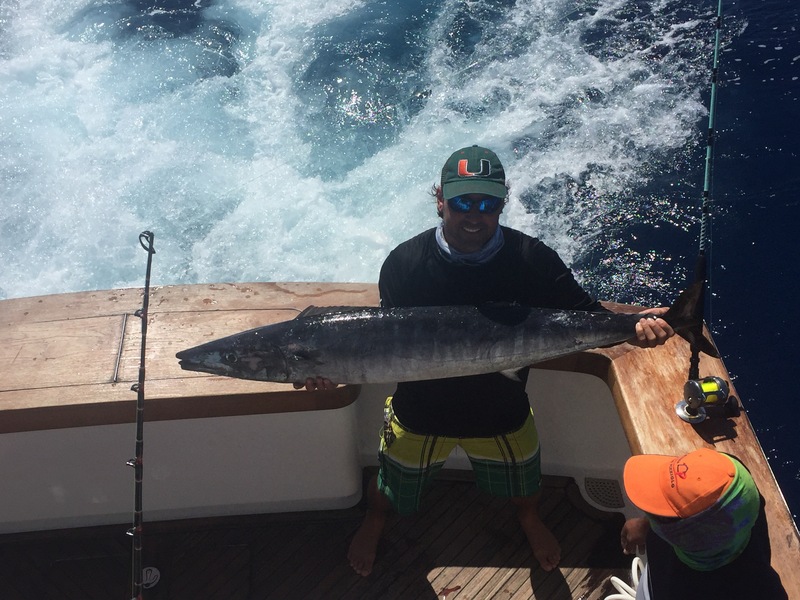 Unfortunately, only inches outside of gaff range the big wahoo shook its head and chewed through the leader. Major bummer. We trolled until dark and managed to catch a 54# wahoo on a Bomber CD30, a small mahi, and then got another nice yellowfin in the 60# class on a black and blue sea witch/ballyhoo right before dark. Overnight the bite was slow. We had an erratic swordfish about 2 hours into our first drift and all of his direction changes led to a pulled hook. We released a 160-180# blue shark and had one more shark bite that didn’t develop along with 2 more sword bites that never really fully took the bait. Tough night of fishing but overall, some quality fish and plenty of meat in the box to end the trip. The weather has been relentless over the past month and October seems to be starting off the same. The nonstop NE winds have made it pretty lumpy offshore here in NJ, and Saturday October 1st it was looking like we were going to get shut out again with the rain and wind. We pushed back our departure all morning until at 2:30 pm we decided to give it a go. Getting out of TI Inlet was a bit rough and the ride was wet, but we took our time aboard Exile 65 and had no trouble getting out to the Wilmington Canyon just before dark. Right away we found the break where the water went from 72-76 degrees and got into some excellent action with mahi on light spinning tackle and spent the last minutes of daylight catching plenty of mahi in the 3-8 pound range. We setup at dark with the sword rods rigged with whole squid right away, and it was only a matter of minutes before we were on our first sword. After a great fight, we managed to boat the nice swords, and the trip started off great. 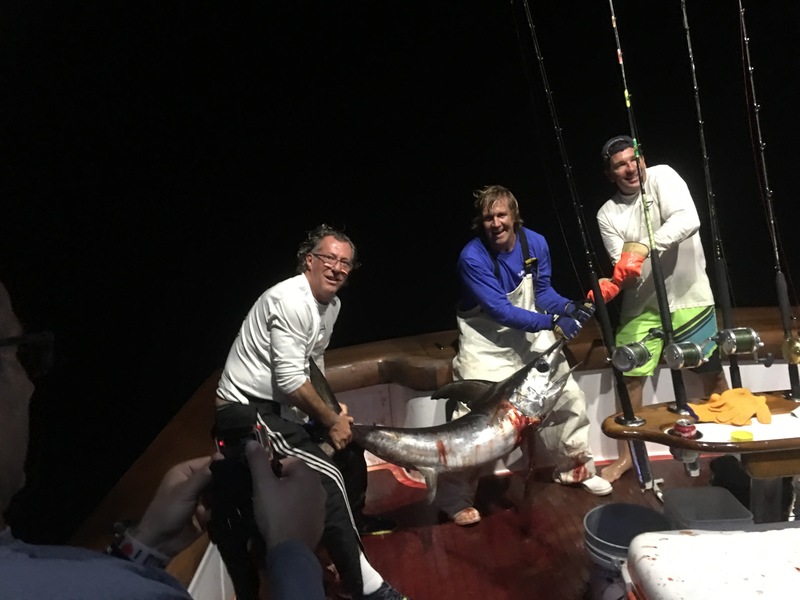 Seas were definitely still rather big so it was a rocky night, but we had consistent action overnight with swords and sharks, but had some very tough breaks and lost a sword and a nice mako, but hey, that’s fishing. We got up on the troll at first light and early on got a triple header of 25-30 pound class yellowfin tunas on Fish DownSea Tuna Flares. I was hoping maybe it would be game on trolling tunas after seeing this, but nope. We managed to go on to catch 2 white marlin on the troll and at noon picked up and ran home. 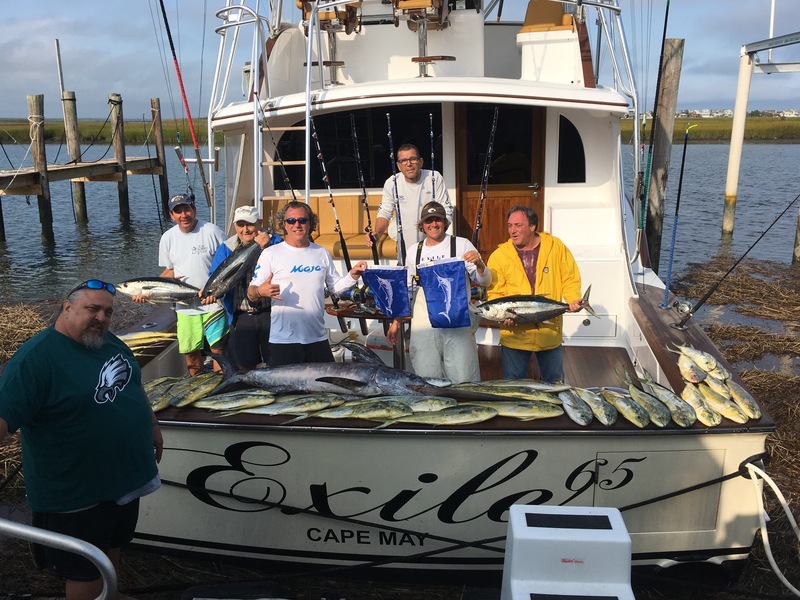 Another great trip on Exile 65 ending with 1 swordfish, 2 white marlin releases, 3 yellowfin tuna, and 39 mahi mahi.